Patriots wide receiver Julian Edelman (11), was named the Super Bowl MVP when he scored a game-high 10 catches for 141 yards (Photograph by Wally Skalij/TNS). Tom Brady and the New England Patriots faced off against Jared Goff and the Los Angeles Rams for Super Bowl LIII Feb. 3. Anticipation was high leading up to the game, with expectations of offensive fireworks between two juggernauts that ranked in the top five of total offense during the regular season. Unfortunately, the game played out more like a “Snooze” Bowl, as the teams barely managed to crack double digits in scoring combined. Fans and media alike described the game as boring on Twitter and other social media platforms, especially given the pre-game hype. NBA superstar LeBron James even chimed in, tweeting, “Man where Shams, Woj, Haynes, McMenamin at??? ?….” The tweet referred to well-known NBA beat reporters who regularly break news stories, suggesting that LeBron thought these stories would be more interesting than the Super Bowl game itself. The 13-3 final score in favor of the Patriots marked the lowest scoring game in Super Bowl history and marked a surprising end to a season of offensive firepower. The first quarter set the tone for the whole game, featuring a back-and-forth defensive battle and multiple offensive miscues. The Patriots opened the game with four-straight running plays behind rookie running back Sony Michel, but Brady threw an uncharacteristic interception on his first pass attempt to kill the drive. The pass was intended for wide receiver Chris Hogan, but was tipped by Rams corner Nickell Robey-Coleman and picked off by Linebacker Corey Singleton. Despite the turnover, the Rams were unable to capitalize and generated very little offensively in the first quarter. The Patriots’ defense gave Jared Goff and the Rams too much trouble, forcing Rams punter Johnny Hekker to punt the ball six times in the first half. Still, the Rams kept the game close behind an equally stout defense and a few more Patriot miscues including a missed field goal. The game remained scoreless until Stephen Gostkowski made a 42-yard field goal with 10:29 left to give the Patriots a 3-0 lead. The longest drive for the Patriots in the first half was 60 yards. On the other hand, the Rams’ longest drive was a mediocre 23 yards. Stunningly, the Rams’ high-powered offense was able to produce only 47 yards of total offense in the first half. 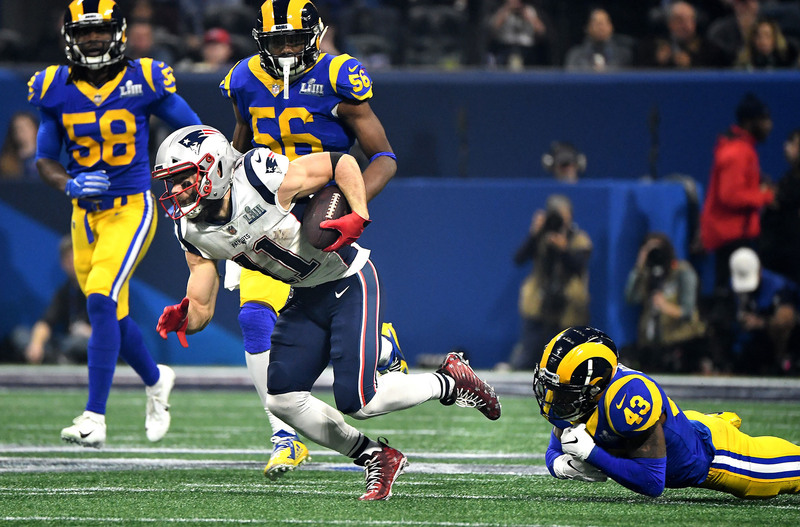 Patriots wide receiver Julian Edelman had more yards than the Rams’ entire team, hauling in seven receptions for 93 yards through two quarters. In the first half, Brady threw for 165 yards and one interception, compared to Goff who managed just 52 yards through the air. The start of the second half featured more of the same offensive ineptitude, as both teams punted on their first two drives. The Rams finally broke the trend eight minutes into the third with a 42-yard drive that resulted in a 53-yard field goal by Greg Zuerlein to tie the game at 3-3. For a game with such little offense to cheer for, the measly field goal was a welcomed break in the defensive struggle. Amazingly, it wasn’t until the fourth quarter that the Patriots finally reached the red zone for the first time in the game. Brady completed a beautiful 29-yard pass to longtime target Rob Gronkowski, and Michel finished off the 69-yard drive with a two-yard rushing touchdown to give the Patriots a 10-3 lead with seven minutes remaining in the game. With the game on the line, what looked like a potential touchdown drive turned out to be a disaster for the Rams. Goff looked the sharpest he did all game, throwing three-straight completions for over 10 yards. However, with the Rams on the Patriots’ 27 yard line, Goff decided to test Patriot cornerback Stephon Gilmore, who has been a stud all season on his way to earning the No. 1 Cornerback rating by Pro Football Focus. Goff’s underthrown ball to Brandin Cooks fell harmlessly into the hands of Gilmore, killing any opportunity the Rams had to respond. The Patriots milked most of the clock, and Gostkowski hit a game-sealing 41-yard field goal. The Rams’ dim hopes ended when Zuerlein missed a field goal. The Patriots’ triumph gave Tom Brady his sixth Super Bowl victory. Bill Belichick simply outcoached Sean McVay throughout the game, as McVay was unable to adjust to the defensive changes the Patriots made. Fans also questioned why the Rams only gave their star running back Todd Gurley 10 carries in the game. Gurley was an MVP candidate last year and rushed for over 1,200 yards this season, but he was not featured in the game plan. The Super Bowl MVP was Edelman, who finished the game with 10 receptions for 141 yards. After the Super Bowl victory, fans are wondering if Tom Brady will retire even though he was adamant during the season that he is going to keep playing. If he does in fact choose to retire, he will be one of the few legends of the game who are able to go out on top.